Klotzli Knives of Switzerland is a company that was founded in 1846, well known internationally for creating innovative of cutting-edge knives. 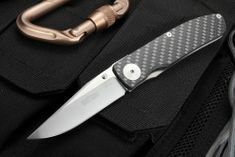 The models they make are generally upscale folding knives of titanium, carbon fiber, and premium stainless-steel alloys. We have long carried Klotzli's knives because of their precision workmanship, use of advanced materials and the lifetime guarantee of a fine Swiss-made item. Klotzli was one of the first knife companies to utilize carbon fiber in their knives and continues to work with some of the most modern designers in the custom knife community. H.P. Klotzli, a fifth-generation knifemaker, personally watches over the production and individually checks each knife that leaves his small workshop. 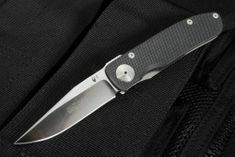 We are proud to offer this line of high-quality Swiss-made folding knives at KnifeArt.com. Each Klotzli knife is crafted to have classy flare along with its superior build quality. The Swiss Border Guard Knife is the same knife issued to the country's border guard personnel. 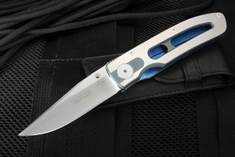 This EDC folder has a Bohler N690 stainless steel 3.75-inch blade that can be used for tactical purposes in a pinch. The ACC-M2-C is another practical everyday knife, as this Michael Walker design Klotzli Swiss-made tool uses both aerospace titanium and textured G-10 in the frame for unmatched durability and grip. Other options include dress folders and carbon fiber folding knives that are slim, lightweight and stylish. KnifeArt has same-day shipping on all in-stock Klotzli knives if you order by 5:00pm CST on weekdays.